David Villa has joined the group of football fans who believe his former Barcelona teammate Lionel Messi is undoubtedly the greatest player ever. Villa currently playing for Japanese team Vissel Kobe rated the Argentine great above the likes of Pele, Maradona and Cruyff owing to the fact he didn’t see them play. Fondly known as El Guaje, the former Valencia ace spent a number of trophy-laden seasons with the Argentine at the Camp Nou and, for him, there is no debate about who the best is. “Leo Messi is the greatest player of all time,” Villa said in an interview with Reuters and cited on Marca. “Obviously with the likes of Pele, Diego Maradona and Johan Cruyff, I didn’t have the chance to watch them like I used to see Messi every day, in every game,” he added. 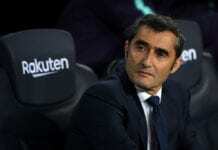 The Catalan giants will unleash a well-rested Lionel Messi against Manchester United on Tuesday night as they seek to build on their one-goal lead from Old Trafford. 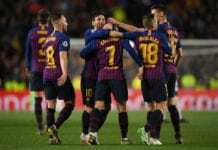 Barcelona are still in the hunt for another treble having secured a spot in Copa del Rey final coupled with a healthy lead at the summit of La Liga.